This version brings a significant speed up for opening larger Outlines and also shows an animation while loading. Use a left/right swipe to quickly change the level of an activty. There is a new view menu with all the different views behind (more views to come in future releases). And we have a search functionality now. Use the Search button on your phone or the Search menu. 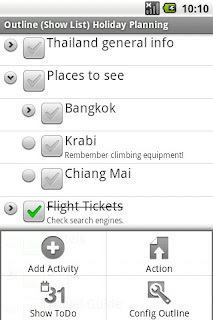 Outliner finds all Activities matching the criteria you put into the search field. Outliner searches the Activity names and notes. If you start the search from the list of Outlines, Outliner searches all Outlines. Starting the search from the list of Activities only finds Activities within the actual Outline. 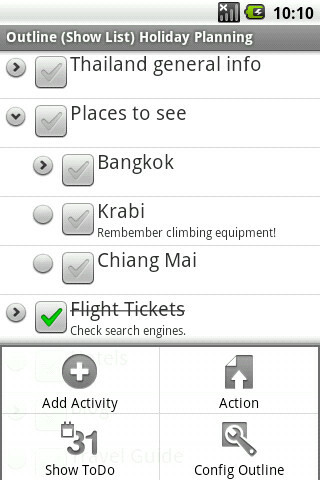 If you have the PRO version, you can click an Activity in the list of found Activities. Outliner opens the Outline, positions the Activity topmost and marks it. In addition to normal search you could use search to establish a tagging system. Put tags (e.g. 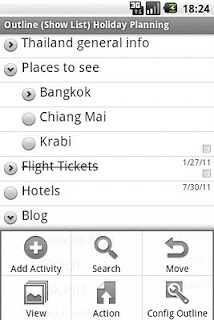 #shopping, #friends, #holiday, ...) into your Activity notes or names and easily find Activities matching the tag. Intelligent organizing of the tags even gives you more flexibility (#shopping.food, #shopping.clothing, #holiday.thailand, #holiday.us, ...). 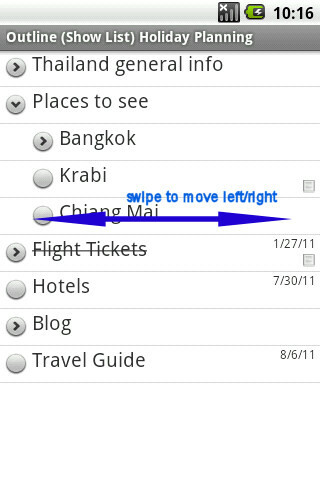 You can now move activities left/right by swiping (moving your finger). Expect a move mode and drag&drop in the next releases. The menu of the activity list is cleaned up by a new "Action" menu now. All actions relating to the whole Outline are now under this menu. If you hide your note via "Config Outline" you can see a small icon in the activity list now indicating that a note exists. If you add a new activity, you can use the context menu (long click) of an existing activity to add the new one as a sibling under the existing one. Use the normal menu to add the activity at the end. This release is mainly a bug fix version with fixes and small improvements. The beta tester group works on testing the sync to Natara Bonsai. Thanks to the Beta Testers for the great work! Depending on the size of your fingers and the resolution of your phone it can be difficult to correctly hit the buttons in the list. You my accidentally start editing an activity instead of expanding a sub-tree. To avoid this you can tell the system to enlarge the size of the buttons by surrounding them with empty space. Try the different values and choose the one being the best compromise between wasted room and good usability. This is found in "Settings, Button Padding". Thank you for all the suggestions and the friendly comments. This version adds some enhancements when importing Outlines from Natara Bonsai. And it adds the possibility to temporarily peek into the notes of an activity by choosing the context menu in the activity list without opening the edit dialog. And you can configure (Settings) how many lines of a note are shown in the actvity list (if notes are shown at all). The beta tester group now has a version which syncs to Natara Bonsai. After finding all the bugs (I am quite sure that there are some) it will reach the market as well. Please be patient. The toDo view only makes sense if you have due dates in your outline. The Back button brings you to the list of Outlines. 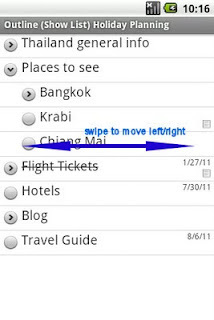 Via Menu button you switch back to the list of activities. 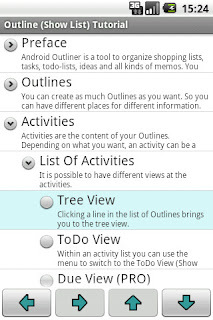 This version brings a better usability when navigating and clicking in the activity tree. It is now easier to hit a row and you also get a visual feedback now. And you can use your d-pad or keyboard to navigate in the tree. Use left/right to toggle collapse/expand. Try click and long click. Bonsai CSV import uses the character set for most western languages (ISO-8859-1). If you work with other character sets like russian or japanese and you want to import or export CSVs, it is better to use a general character set which understands all languages. This is why Outliner also exports and imports CSVs with "UTF-8" character set now. Please check the tutorial.